So. Feel free to tell me in the comments if you've found a retelling of one of these tales that you love, or just one you know of. The Tale: This disturbing little tale is one I don't think I've ever heard another person mention anywhere, ever, but it is one of my absolute favorites. It comes from Hans Christian Andersen, and like all HCA tales, it's pretty bleak. 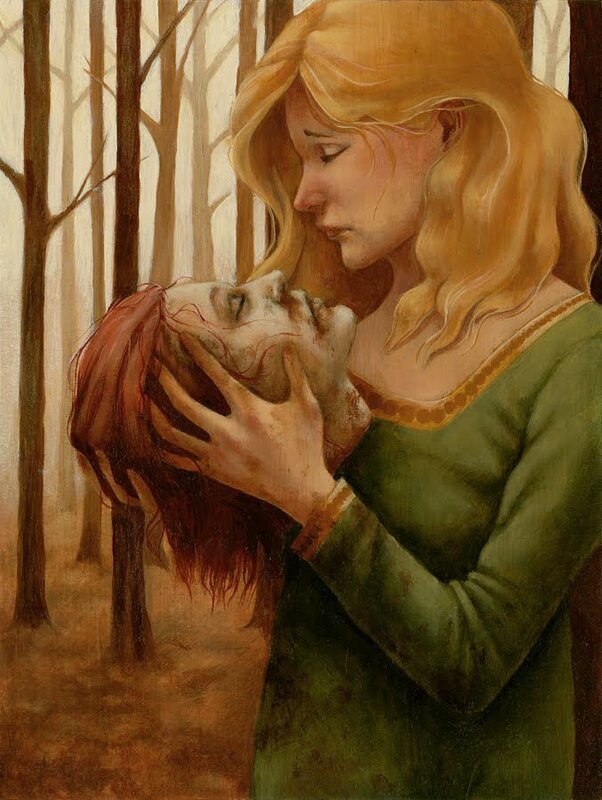 It concerns a rose elf who witnesses the courtship of two young lovers, followed by the murder of the boy by the girl's controlling brother, who stabs the young lover, cuts of his head, and then buries him. The rose elf whispers the story of what happened into the girl's ear while she sleeps, and in the morning, she goes to find her lovers body. She can't bear to be without him, so she takes his head (it's all she can carry) and plants it in a pot with some jasmine, and waters it with her tears. Until she dies. Troubled that the brother is getting away with murder, the rose elf and some helper friends break the jasmine pot and the lover's head spills out, alerting the townspeople to the wicked brother's nefarious deeds. What I'd like to see and why I want to see it: As I said, I love this tale. In fact, I have retold it myself (in the form of a really long, really convoluted poem for a writing class I took once), and as disturbing as it is, you can't deny it's memorable. The Tale: Parents bargain away their daughter to a witch for some stolen lettuce; the witch who grew the lettuce names the girl after it and then locks her away in a tower where she grows her hair and sits around doing whatever one does in a tower (one would imagine) until some stranger climbs her mothereffing hair and knocks her up woos her - only to be thrown from the tower into brambles, where he goes blind, then wonders into a desert (?) until Rapunzel rescues herself, and then him, all while caring for twins. What I'd like to see and why I want to see it: Remember when I said I know some of these have been retold? Yes, I know this has been retold, and I've even liked some of the retellings, I guess. But the thing is, none has ever gone where I'd like to see it go. I mean, there are so many questions in this tale: Why is the witch the bad guy? I've always sort of figured her for being someone who's just trying to protect a girl who would undoubtedly have been neglected otherwise. I mean, when you're parents are willing to trade you for a pregnancy craving for lettuce, you're future doesn't seem to sure. And then with the prince who climbs her hair into her tower - has Rapunzel even seen a man before? I really feel like both women in this story got a raw deal, and that hasn't changed in any of the tellings. I'd like to see someone really explore the gray area here, and explore the witch's past and Rapunzel's isolated upbringing. This has the stamp of dark family drama all over it. 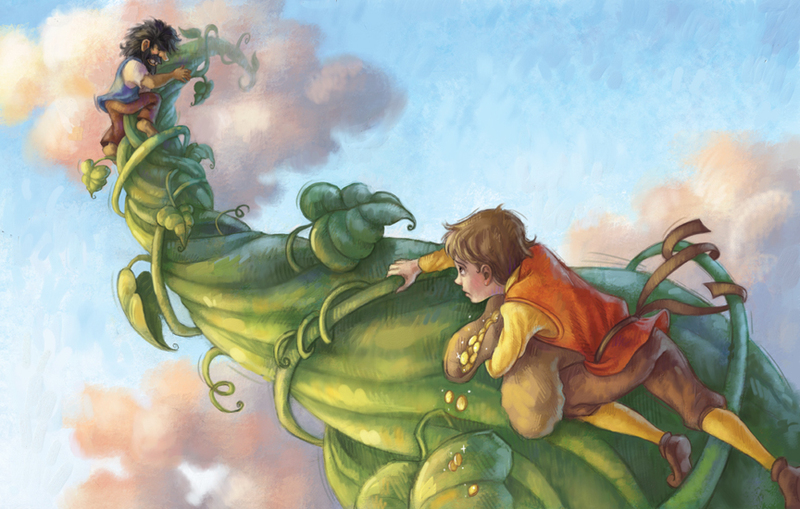 The Tale: A young dolt named Jack trades his family's only means of survival for a handful of "magic" beans that grow into a giant beanstalk, which he proceeds to climb into the sky. Among the clouds, Jack discovers a giant's house, which he proceeds to rob, and when the giant tries to pursue him, Jack cuts down the beanstalk and kills the giant. What I'd like to see and why I want to see it: This has always been one of my "problem" tales. It's always been a favorite (because it's really fun as a kid to walk around Fee Fi Fo Fum-ing), but it's never seemed right to me. I mean, Jack is an idiot, he's a thief, and finally, he's a murderer. I mean, really! How is he the hero of this piece? I'd really like to see a tale that either approaches things from the giant's POV or narrates from Jack's with him being a very clear anti-hero. I want something to delve into the ickiness and inherent wrongness of the story, and treat it either as a fated tragedy or a murder mystery. Awesome choices! I would really enjoying reading the retellings of those fairy tales. I would really like to read a retelling of The Princess and the Pea. It's one of my favorites :) Great post! I'm almost positive that I read a version of Jack and the Beanstalk once that was from the Giant's point-of-view and portrayed Jack negatively. I can't, for the life of me, remember the name of it though. I'm pretty sure it was either a picture book or a play. Good points on all three stories. I actually thought that Sondheim's Into the Woods treats the witch/foster mother from Rapunzel in a pretty sympathetic way. Her song, Children Will Listen, is definitely a mother's anthem. Great choices. The Rose Elf sounds crazy/wicked. As far as Jack is concerned, I'm tempted to say "stay tuned"- as my third TaleSpins story is shaping into a bit of a mash-up starring the Beanstalk Boy himself. How have I never heard of The Rose Elf?? Need to read that one ASAP. My favorite retelling is Snow White and Rose Red by Patricia C. Wrede, it's also my favorite fairytale. Except Beauty and the Beast of course.. I think Jack and the Beanstalk has been pretty well treated in a few different retellings, all of which are different but explore those very questions. Try The Thief and the Beanstalk by PW Catanese, or Crazy Jack by Donna Jo Napoli, or Jim Henson's Jack and the Beanstalk: the Real Story (for a movie version!)... they all give it what I thought were pretty unique angles of exploration. For Rapunzel I'd recommend Kissing the Witch by Emma Donohue. It's a short story in a series that flows chronologically backwards as each story has a character who ends up telling her story to someone else. It's brilliantly done and has some very different fairy tale interpretations! I'd like to see a movie version of Beauty and the Beast that I can really get behind; all the versions that I've seen always seem to fall short of the potential of the story, romantically and as far as the tension of the situation goes. Maybe someday they'll adapt Heart's Blood by Juliet Marillier as a movie: I'd love to SEE that! Ashley - No, I haven't read Zel, but I remember you talking about it last year. Alyssa - Whaaaaat?! How did I not know Patricia C Wrede wrote a fairytale retelling? I LOVE her writing! Everyone, re: Jack - I know Jack (and Rapunzel's witch) have been dealt with well in movies and plays, but I just haven't seen anything in a book that captures what I'm looking for. RL - Kissing the Witch sounds AMAZING. I love inventive ways to tell a story like that. Love the choices. Rose Elf sounds crazy-good. I, too, had never heard of it. Thanks! As far as Jack is concerned, I'm tempted to say "stay tuned" as my third TaleSpins book is shaping into a twist-fest starring the Beanstalk Boy himself. On that note, thanks to "A Backwards Story" for pointing out "Half Upon A Time" (I looked up author: James Riley) -- I'll have to check that out too! The Rose Elf sounds WICKED dude!!!!! Jack and the Beanstalk was always one of my favorites! Interesting, The Rose Elf must have been adapted from one of the stories in Boccaccio's Decameron. I thought it was a crazy story when I read it too.